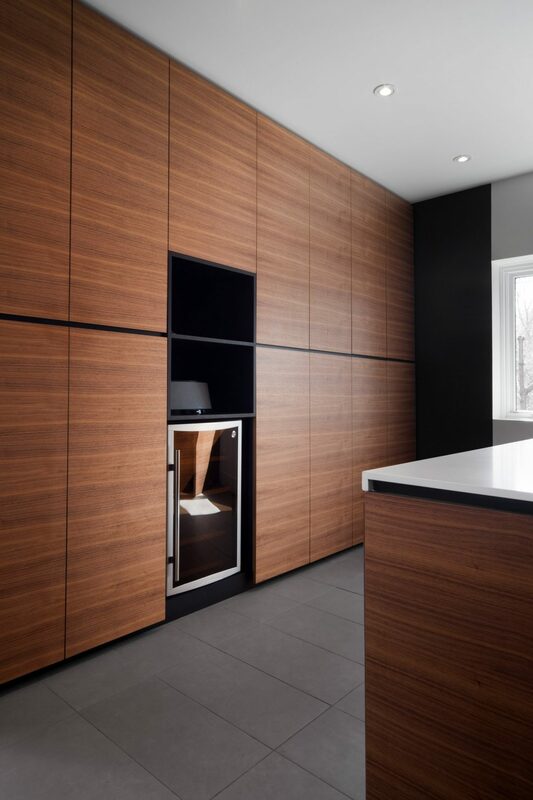 A horizontal grain is repeated in the walnut veneer of the kitchen table, island and standalone cabinet units while accentuating the kitchen’s design. Josée Anne Bergeron’s kitchen was already the heart of her family’s Pointe-Claire home, but even she was surprised by how a kitchen redesign could change the feel of the entire house and make the room more functional and user-friendly. 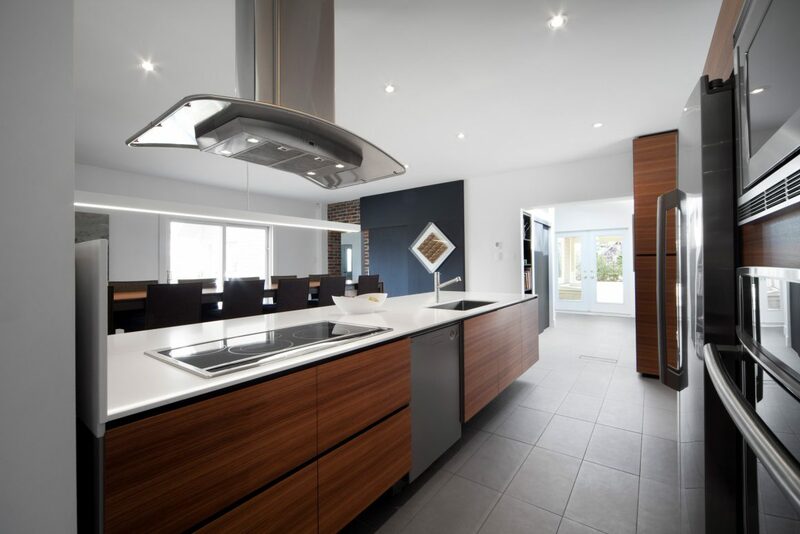 Everything has its place in the new contemporary-style kitchen that replaced the former old, country-style one. And now there’s room for more than one cook, thanks to the large island. What’s more, as many as 14 can be seated for dinner around a 12-foot-long kitchen table. 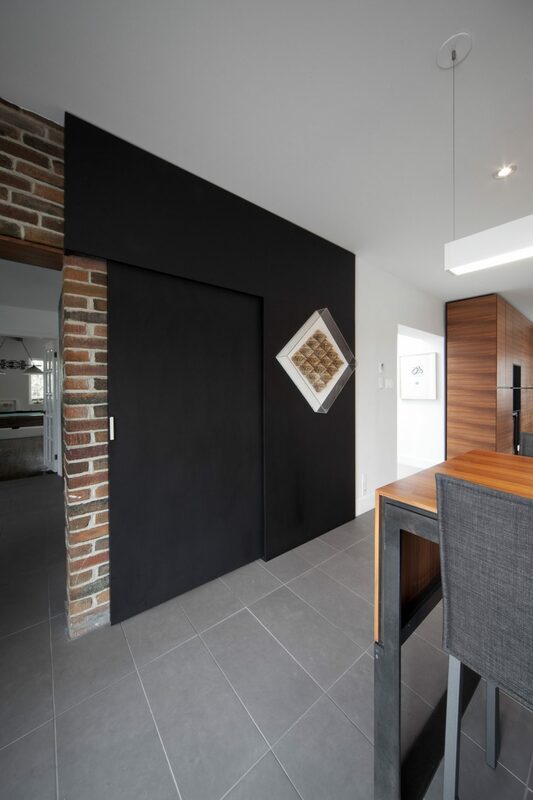 The new design opened up the front hallway to allow light and air to get into the kitchen. 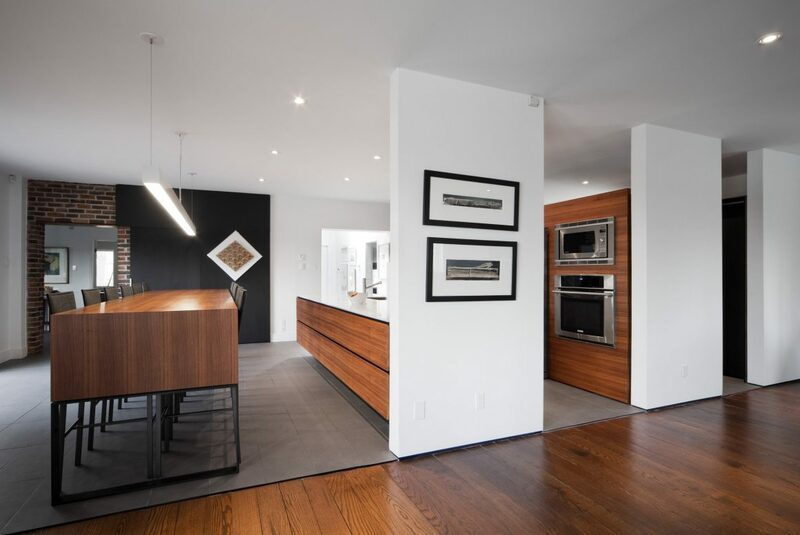 The oversized range hood was a special request of the homeowners. There were tight squeezes here and there and limited counter space. 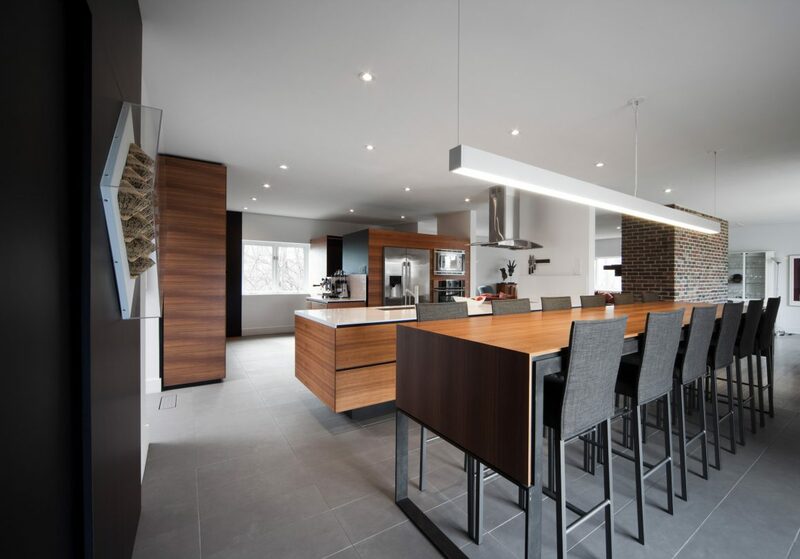 Painchaud says he transformed the space into what the homeowners wanted by removing the walls separating the kitchen, living room and dining room, and then creating an open-plan design, with the kitchen as its hub. The wrought-iron base of the 12-foot-long kitchen table was custom-made. The homeowners found chairs that matched remarkably well. 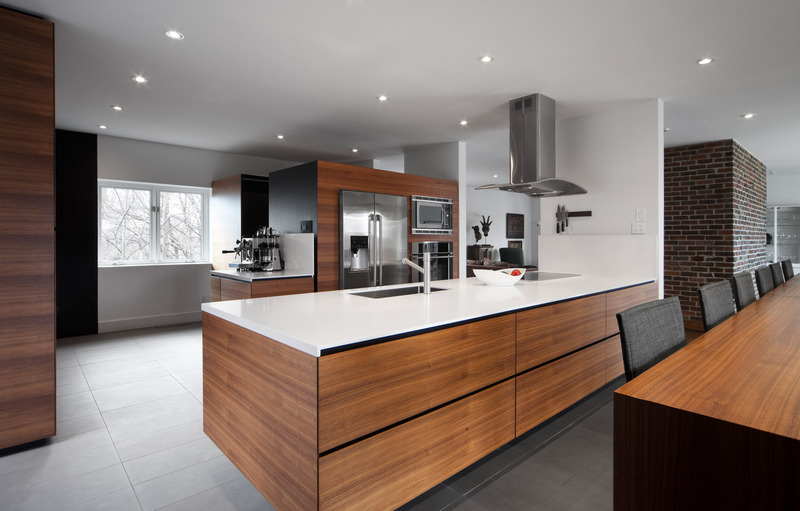 The new kitchen is designed around what Painchaud calls “three volumes” – by which he means three oversized stand-alone cabinets, covered in walnut veneer and serving both a utilitarian and aesthetic function. 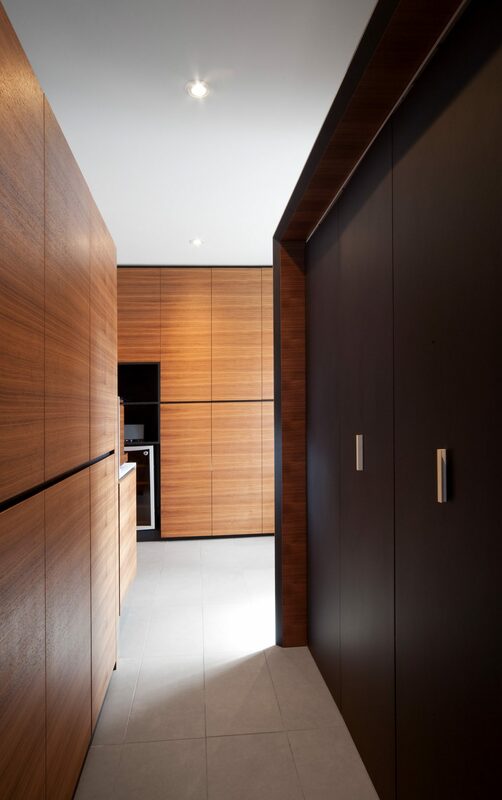 The three cabinet units are situated in the middle of the kitchen and run parallel to one another, with space between them to allow the homeowners to circulate. One “volume” serves as the kitchen island and has a quartz countertop, sink, dishwasher, pot drawer, range and stainless-steel hood. 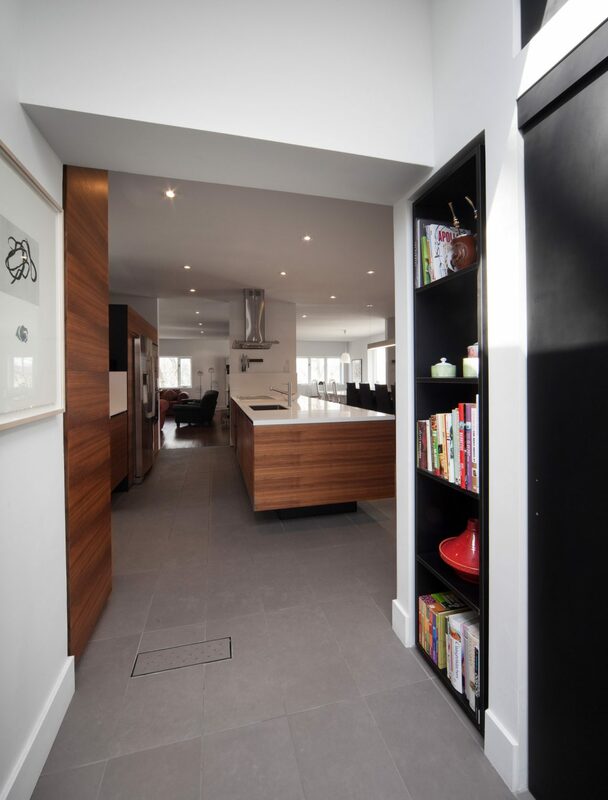 The second contains a side-by-side fridge, two ovens and cabinets for food and dishes. The third houses the washer, dryer and laundry storage. 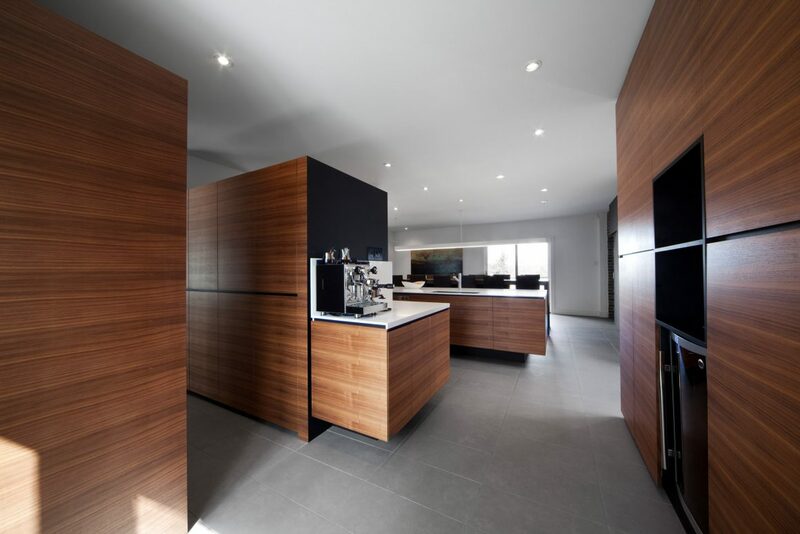 An espresso coffee machine with its own counter makes for easy mornings and entertaining. A wine cooler was installed in the kitchen cabinets opposite. The kitchen-island cabinet appears to be floating because its floorboard kickplate was set 10 inches deep, instead of the usual three inches. And, taken together, “the three volumes” look like a series of modern sculptures. 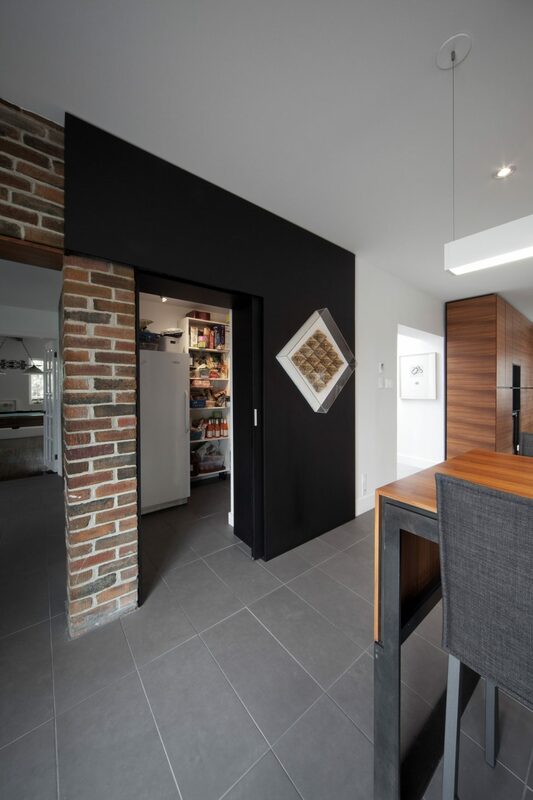 Sliding doors conceal the pantry, which is original to the old kitchen; it now houses a second fridge and more shelving.